When employers and employees talk about employment being “at will,” it generally means that the employment relationship can be terminated by either party at any time, for any reason. However, that termination can become more complicated if there is a “non-compete clause” involved. Very broadly, non-compete clauses bar you from going to work for a competitor when you leave your employment. Approximately one in five workers is affected by these clauses. However, while they are often good for employers, they aren’t necessarily good for employees, and are sometimes even at odds with labor protection laws. Unfortunately, the at-will doctrine allowed for many workers to not only be threatened with firing if they joined a union, but ultimately, if they failed to do whatever their employer demanded of them until the National Labor Relations Act was passed, which granted all private sector workers and unions the right to engage in collective bargaining with employers. As a result, in some circumstances, at-will employment transformed into employers having to prove “just cause” before firing anyone. The Civil Rights and Americans with Disabilities Acts then prohibited discrimination and provided protection to individuals with disabilities in the workplace. However, none of these federal laws address non-compete clauses and unfortunately, these clauses can significantly interfere with the ability for workers to seek better-paying jobs elsewhere and improve working conditions in general in a given industry when used. 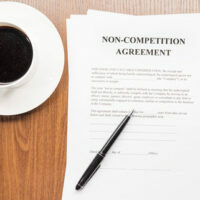 The ability for employers to use non-compete clause provisions depends upon the state. In Florida, for example, enforcement of contracts that restrict or prohibit competition during or after the term of restrictive covenants are not prohibited as long as those contracts are reasonable in time, area, and line of business. However, a court cannot enforce a restrictive covenant like this unless it is set forth in writing and signed by the employee. In addition, the employer must plead and prove the existence of one or more legitimate business interest to justify the restrictive covenant, where legitimate business interests include trade secrets, valuable confidential business or professional information, substantial relationships with prospective or existing customers or clients, customer, patient, or client goodwill, or specialized training. The employer must also plead and prove that the contractually-specified restraint is reasonably necessary to protect the legitimate business interests justifying the restriction. Thus, any restrictive covenant not supported by a legitimate business interest is unlawful, void, and unenforceable. However, many have called on Congress to pass federal restrictions on non-compete clause, rendering them unenforceable in federal courts unless employment contracts provide for very specific protections, such as protection against arbitrary or unjust employment discharges. If you have been the victim of an unfair or possibly illegal non-compete clause or agreement; contact Robert Norell in Florida today at 954-617-6017 or online to schedule a comprehensive, free consultation regarding your rights.